Types, Characteristics: Architecture, Visual Arts Approved by the Nazis. left is the sculptor Arno Breker. 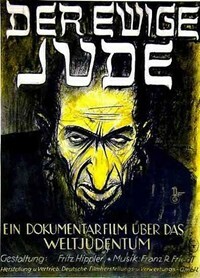 propaganda film "The Eternal Jew". as a swindler and criminal." The term "Nazi art" is commonly used to describe various types of art, created in Germany or German Occupied Territories during the approximate period 1925-45, that received the approval of the Nazi authorities. Architecture, films, photography and poster art, along with sculpture, were particularly favoured by Hitler and his Minister of Culture and Propaganda Joseph Goebbels - largely because of their propagandist value. Among the leading Nazi artists were the architect Albert Speer (1905-81), the film-director Leni Riefenstahl (1902-2003), the sculptor Arno Breker (19001991), and the poster artist Hans Schweitzer (better known as Mjolnir) (1901-80), all of whom survived the war and lived to a ripe old age - unlike the 11 million victims of the Holocaust whose fate was shaped by Nazi propagandist art of the 1930s and early 40s. Nazi approved art is classified as one of three main categories of Holocaust art: the others being works created by camp inmates or witnesses, and postwar memorials. Note: the word "Nazi" comes from the first two syllables of the German pronunciation of the word "national". It refers to members of the National Socialist German Workers' Party; NSDAP (National Sozialistische Deutsche Arbeiterpartei). In one sentence, the basic model for Nazi art was that of classical Greek and Roman art, a heroic and romantic idiom which (Hitler thought) perfectly embodied the aryan racial ideal. The main purpose of Nazi art was to promote Nazi ideology and to champion the National Socialist struggle. For example, during the 30s, Hitler's primary aim was to create the illusion of an all powerful German state - the so-called "Thousand Year Reich" - in order to intimidate its citizens and impress its European neighbours. Nazi architecture was especially valuable in helping to convey the impression of power and permanence. These qualities were realized through the use of giant structures built in the style of neoclassical architecture, like Roman triumphalist buildings of antiquity. Notorious examples of Nazi architecture include: the Zeppelinfeld stadium used to host the Nuremberg rallies; the Berlin Olympic Stadium; the German Pavilion for the 1937 International Fair in Paris; and the New Reich Chancellery off the Wilhelmstrasse. New techniques included the use of dozens of searchlights shining vertically upwards in order to create Speer's awesome "cathedral of light". Posters were another important art form and an instrumental feature of Nazi street propaganda. They were carefully designed to influence public opinion through the use of stereotyped images and motifs, such as the hook-nosed Jew and the vigorous blonde Aryan. They were used (inter alia) to denigrate Jews, promote anti-semitic films and exhibitions, recruit SS volunteers, scare the population with the Bolshevik menace and mobilize it for total war. Ironically, in their colours, motifs and overall iconography, Nazi posters are strikingly similar to the Soviet style of Socialist Realism - indeed, the name "heroic realism" is often used to describe both. Sculpture was another important type of public art exploited by the Nazis. 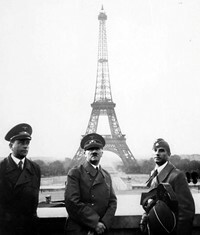 It was used mostly in an architectural context - such as the huge eagle placed on top of the German Pavilion in Paris (1937), which looked down on the smaller Soviet pavilion opposite. Other examples include "The Party" and "The Army" - two statues by Arno Breker (who replaced Josef Thorak as the top Nazi sculptor) which were placed at the entrance to Speer's New Reich Chancellery in Berlin. Painting was much less important in the Third Reich, although the genre was a major target of Hitler's campaign against so-called Degenerate art (entartete kunst), overseen by his favourite painter Adolf Ziegler (1892-1959). The basic message was: "modern art" had no place in Nazi Germany. Only traditional paintings - championing values of racial purity, Heimat (love of homeland) and other "volk-ish" values - were deemed acceptable. The approved style was similar to that of conventional academic art - that is romantic realist painting based on classical models. The main reason behind this was Hitler's belief that - while modern art was thoroughly corrupted by Jewish influence - Greek and Roman forms were uncontaminated. Starting in 1933, officials from the Reich Chamber of Culture methodically set about banning the majority of modern artists from exhibiting - even practising - their art. The campaign culminated in July 1937, in a huge exhibition of some 700 "degenerate" works at the Hofgartenarkaden in Munich. Painters whose works were banned in this way included: Edvard Munch (1863-1944) a pioneer of expressionism; Ernst Ludwig Kirchner (1880-1938) leader of Die Brucke; Wassily Kandinsky (1866-1944) leader of the Der Blaue Reiter; the Jewish-Russian painters Marc Chagall (1887-1985) and Chaim Soutine (1893-1943); the Germans Otto Dix (1891-1969) and George Grosz (1893-1959), members of Die Neue Sachlichkeit; the Austrian Oskar Kokoschka (1886-1980); as well as Pablo Picasso (1881-1973) and Modigliani (1884-1920). For other victims of the Nazi cultural machine, see also Herwarth Walden founder of the Sturm Gallery and magazine in Berlin. 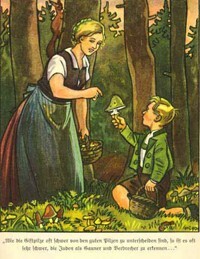 Arguably the most insidious form of Nazi art was the illustration in certain children's books, such as the antisemitic book, "The Poisonous Mushroom" (Der Giftpilz) (1938). Other notorious graphics included the vile caricature art created for Julius Streicher's newspaper Der Sturmer, by cartoonists like Philipp Rupprecht (1900-75), some of which proved too crude even for Goebbels. But the most potent form of Nazi art was film. The Third Reich's culture supremo Joseph Goebbels maintained close relationships with numerous film directors in order to create highly effective feature films and newsreels. Notorious films included "The Eternal Jew" (Der ewige Jude), which juxtaposed scenes of teaming rats with crowds of Jews. Less crude but more manipulative were the propaganda films made by Leni Riefenstahl (1902-2003), notably: "The Victory of Faith" (Der Sieg des Glaubens), a film of the Nuremberg Party Rally in 1933; "Triumph of the Will" (Triumph des Willens) a film about the Nuremberg Rally in 1934; and "Olympia", a propaganda documentary on the 1936 Olympics. Documentary photography was also used (or, more accurately misused) to promote Nazi ideology. As well as court photographers like Heinrich Hoffmann (1885-1957), other camera artists were employed on a variety of propaganda projects, such as the photographing of deformed or handicapped Jews, in order to convey the impression that they represented the norm for their race. In September 1933, within months of Hitler's appointment as Reich Chancellor, a new Reich Culture Chamber (Reichskulturkammer) was set up under Joseph Goebbels, the new Minister for Public Enlightenment and Propaganda. Separate sub-departments were established to regulate the press, book publishing, film, theatre, music, and the visual arts. The function of the Reichskulturkammer was to encourage and expedite the Aryanization of German culture and to prohibit meaningless "Jewish-inspired" art forms such as Expressionism (in which Germany had led the world), Surrealism and Cubism (two styles strongly associated with Paris), Jazz and Blues music (mainly American). In fact, almost all avant-garde art was instantly seen as tainted by Judaism, and banned. In order to exercise control over visual art and ensure that artists complied with the new Nazi guidelines, only artists who were members of the Reich Culture Chamber were allowed to practice their art. Meanwhile the Nazi campaign against Degenerate art was busy confiscating some 16,000 works from the best art museums and galleries across Germany. Hitler's favourite architect, later Minister of Armaments, the talented Albert Speer took over from Paul Ludwig Troost (1878-1934) (noted for his design of the Fuhrerbau and the Haus der Kunst in Munich) as the leading Nazi architect. A champion of classicism in art, Speer's first major commission was the Zeppelinfeld stadium in Nuremberg - a massive structure inspired by the Pergamon Altar, capable of accomodating 340,000 people, which he enhanced dramatically at night by surrounding it with 130 anti-aircraft searchlights (cathedral of light). Other important commissions included the New Reich Chancellery, with its 146-metre long Marble Gallery. Appointed General Building Inspector for Berlin, Speer produced plans and models to substantiate Hitler's post-war architectural fantasies, before undertaking more mundane military tasks of building concrete fortifications and other military structures. See also 20th Century Architecture in Europe and America. Inspired to become an actress after seeing a poster for the 1924 film "The Mountain of Destiny" (Der Berg des Schicksals), Riefenstahl starred in five motion pictures before finding her true calling, in 1932, as a film director. Mesmerized by Hitler, who became a personal friend, her greatest contribution to Nazi art were her three propaganda films exalting Hitler, the Nazi Party as well as the twin ideals of Aryan strength and Nordic beauty. The films were "The Victory of Faith", profiling the 1933 Party Rally; "Triumph of the Will" about the Party Rally in 1934; and "Olympia", reviewing the German sporting achievements at the 1936 Berlin Olympics. In February 1937, during a promotional tour of the United States, Riefenstahl told a reporter for the Detroit News, "To me, Hitler is the greatest man who ever lived." In 1993, when interviewed in connection with the documentary "The Wonderful, Horrible Life of Leni Riefenstahl", she denied any suggestion that she deliberately created Nazi propaganda. Schweitzer, better known as Mjolnir ("Thor's hammer") was a notorious artist who created numerous posters for the Nazi Party under Adolf Hitler. His range of graphic art included caricatures of Nazi enemies, notably Jews and Communists. Famous examples of his work include: the 1940 poster promoting the anti-Semitic film, "The Eternal Jew"; and the 1943 post-Stalingrad poster on the theme of "Victory or Bolshevism". He was made Reich Commissioner for Artistic Design and Chairman of the Reich Committee of Press Illustrators. After the war, he was fined 500 Deutschemarks for his Nazi activities. Hitler's favourite sculptor, Arno Breker worked for the Nazis throughout the period 1933-42, becoming official state sculptor in 1937. Hitler thought that Breker's statue "The Army" was the most beautiful work of plastic art ever made in Germany. A master of bronze sculpture and also stone sculpture, his other major Nazi works included: "The Party", a figurative embodiment of Aryan power; "Zehnkampfer", an Olympic decathlete; "Die Siegerin", a winning female athlete; as well as "The Guard", "The Warrior" and "Preparedness". Although noted for a style of neoclassical sculpture, certain features of his work are more reminiscent of mannerist art of the 16th century. Amazingly, after the war he was offered a job by Joseph Stalin, which he declined. In 1948 he was officially classified as a Nazi "fellow traveller" and fined. A pioneer member of the Nazi Party from the early 1920s, Adolf Ziegler met Hitler in 1925 and was later commissioned to paint a commemorative portrait of Hitler's niece, Geli Raubal, who had committed suicide. He was made a professor at the Munich Academy in 1933, before being appointed head of the Nazi campaign against Degenerate art (1933-7). In 1935, he was appointed Senator of the Fine Arts at the Reich Chamber of Culture, and in 1936 President of the Chamber of Art. By 1937 he had become Hitler's favourite painter, and several of his works - such as "the Judgement of Paris" and "The Four Elements" - were acquired by the Fuhrer for his Munich residences. A former admirer of German Expressionism (authoritatively condemned by Hitler in 1934), Ziegler was known for his no-holds-barred female nudes depicting the supposedly ideal Aryan figure, as well as a quantity of genre painting and allegorical works. During the war, Ziegler was incarcerated in the Dachau concentration camp for six weeks after publicly expressing defeatist views. Style of sentimental, true-to-life painting - a 19th century Germanic idiom elements of which are reminiscent of some Nazi art (without the politics). One of the last art movements of 19th century German art. The German Labour League or German Work Federation founded by Hermann Muthesius (1861-1927), to improve the design of German products. Holds the world's most comprehensive collection of Ashkenazi, Sephardi and Oriental Jewish religious art, crafts and artifacts. Chronology and impoortant dates in the evolution of arts and crafts.  For more about 20th century German art, see: Homepage.